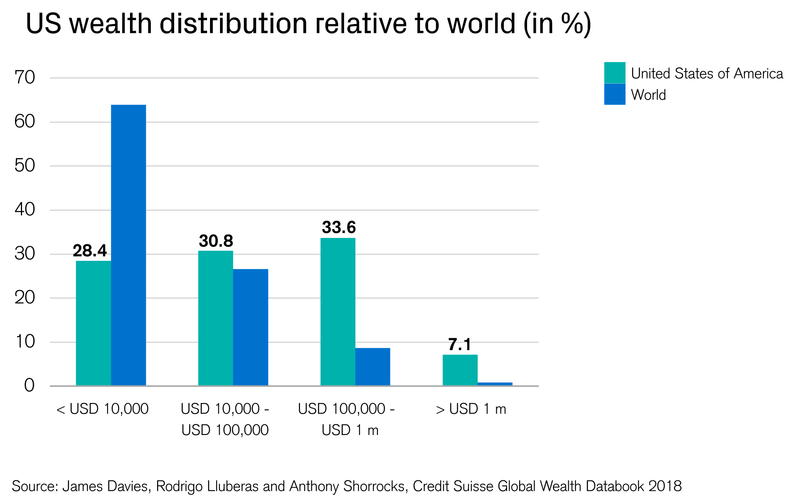 Both the levels and the distribution of household wealth differ widely across countries. There are some notable comparisons. For example, 91% of adults in India have a net worth less than USD 10,000, whereas this percentage is only 33% in China. While in other countries, such as Australia (6%) and Japan (5%), this tier's percentage is very low. This reflects aspects such as the availability of credit, the extent of student debt, home ownership rates, and whether young adults tend to live at home with their parents and are therefore not counted as separate units. 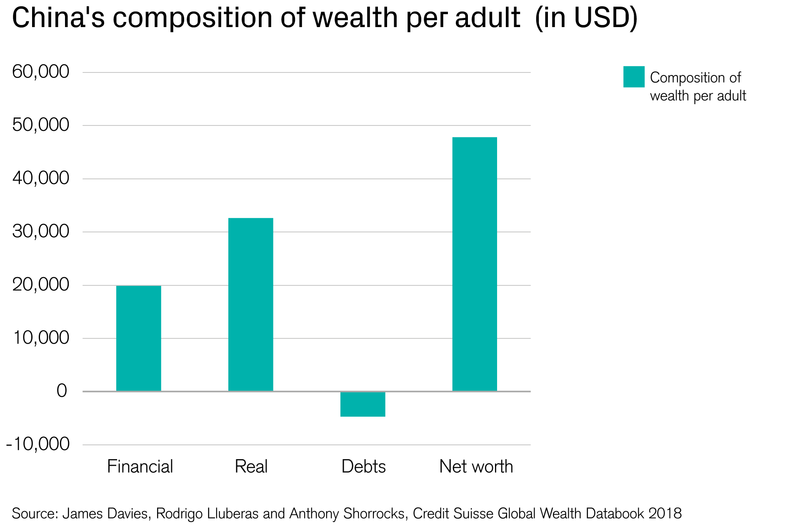 In terms of total household wealth, China currently lies in second place, behind the United States but ahead of Japan. Reflecting a still-strong property market, the proportion of household assets in non-financial form is 62% in 2018. Real assets comprised USD 32,640 per adult in mid-2018. Debt averaged just USD 4,690, equivalent to 9% of gross assets. While concern has been expressed about growing household debt in China, this debt ratio remains low by international standards. After the vote to leave the European Union in the 2016 Brexit referendum, the United Kingdom had a difficult year. Both the exchange rate and the stock market fell sharply. 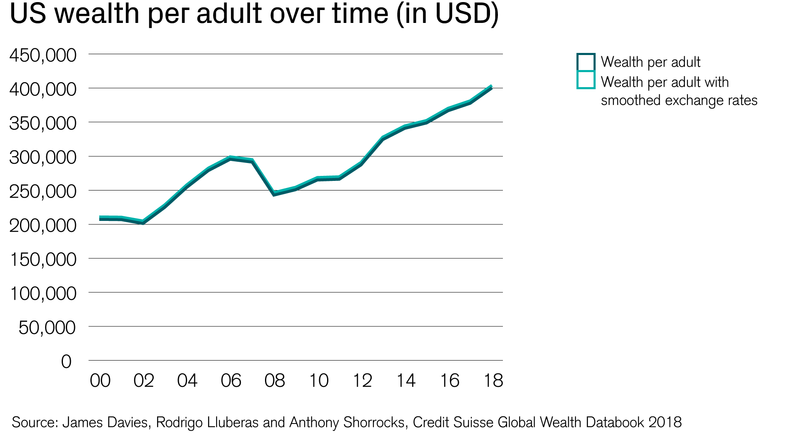 Nevertheless, over the next 12 months, wealth per adult rose 1% in terms of US dollars and 2% in terms of British pounds. The stock market recovered and UK market capitalization went up 10%. During the past year, market capitalization went up by a further 8%, the exchange rate stabilized and wealth per adult rose 6%. However, the Outlook remains uncertain. These samples show the variety of country circumstances and the range of experiences. 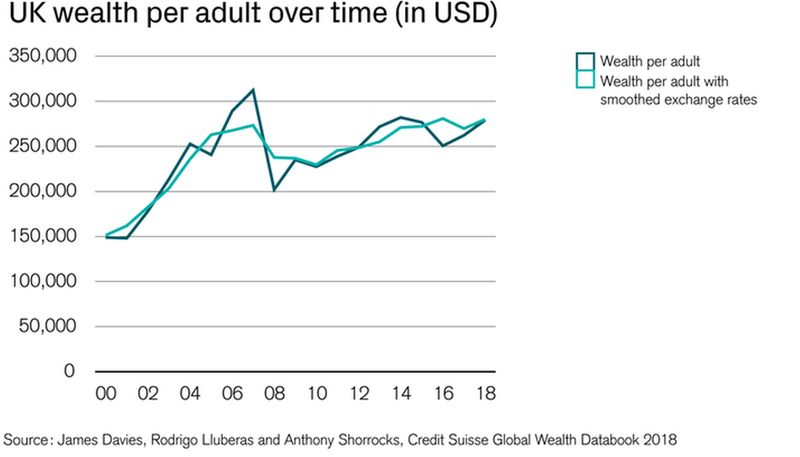 Nevertheless, a common trait is that most countries have recovered from the lows after the financial crisis, with wealth per adult higher in 2018 than in 2007.